Annette Winkler, head of Daimler's Smart division, will be among the speakers June 6 at the Automotive News Europe Congress in Turin. Winkler has led Smart since September 2010. The minicar brand shifted to all-electric powertrains in the U.S. last year, and it showed the Smart Vision EQ concept at the Frankfurt auto show, a fully electric and autonomous vehicle that could be used in car-sharing fleets. In 1995, Winkler started her career at what was then Daimler-Benz as head of public relations and communications for Mercedes-Benz in Stuttgart, and from 1997 to 1999, she was head of the Mercedes-Benz sales and service outlet in Braunschweig, Germany. 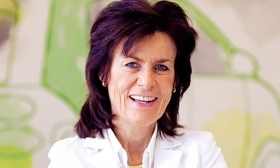 She became CEO of DaimlerChrysler Belgium and Luxembourg in Brussels. From 2006 to 2010, Winkler was responsible for managing Daimler's entire sales network as head of global business management and wholesale Europe.